IR theory, we argue, has few tools for identifying and assessing reactionary politics. Why has IR theory traditionally spent so little time thinking about it? In a new Theory Note (now ungated!) at International Studies Quarterly, we explore the lack of reactionary thought in international relations, and its implications for how IR thinks about reactionary world politics. We write not as reactionaries ourselves, but because we are concerned this inattention may have ill-prepared the field for our current political moment. This post summarizes the project, and considers its implications for the field. We see reaction as having three key aspects. First, reactionaries see the past as better than the present or future. Second, they generally point to an event or process—modern revolutions, industrialization, or other putative disaster—that shattered that past. Third, reactionaries generally blame someone for its loss. (We extrapolate this definition from Mark Lilla.) For reactionaries, long-run change destroys important features of traditional or premodern social and political life. Once mobilized, reaction becomes a remit to rebuild or reclaim that past. In its more militant forms, this can mean excluding or punishing those they blame for its loss. While the past way of life they appeal to may be historically distant—and may even amount to fiction—it motivates them to political action all the same. Disciplinary IR has not generally had reactionary theorists. Most IR theorists have assumed history works differently. Liberals assert or imply narratives of gradual progress. Many realists see history as repeating patterns of power-political contention. For constructivist and critical scholars, history lacks a long run trajectory, or at least lacks one that’s knowable. Reactionaries, by contrast, understand historical progress as both real and disastrous. While some early theorists of geopolitics, and a few of their midcentury descendants, were prone to nationalism or imperial nostalgia, reactionary views were rarely heard in postwar IR. In recent decades, such thought has been almost completely lacking in IR—Huntington’s later work is perhaps the lone exception. More radical figures like Joseph de Maistre more systematically understood modern or Enlightenment “progress” as a bad thing—destructive of the putatively harmonious cultural hierarchies of premodern Europe. Such theorists emerged out of the counter-Enlightenment, denouncing the intellectual and sociopolitical transformations of European modernity as they took on more far-reaching manifestations. In the twentieth century, reactionaries provided grist for, among other things, the ideological mills of multiple strains of fascism. Authors like Julius Evola and Carl Schmitt provided ideological ammunition for far-right projects of world remaking. We do not regret that figures like Evola lack acolytes in IR today. However, we suspect the relative absence of reactionaries from the field’s theoretical canon has hobbled the field with an intellectual blind spot. Historians of political thought understand the counter-enlightenment well. Comparativists have a well developed and rapidly expanding literature on far-right nationalisms. In contrast, IR has said comparatively little about the transnational, foreign policy, or otherwise international aspects of such issues. While that’s recently begun to change, we worry IR has arrived late to the scene, and is theoretically under-equipped. This is surprising in part because, in contrast to debates within IR, reaction has a long and important history in the practice of world politics. We identify two kinds of reactionary practice: revisionism and restructuring. Revisionism aims to radically remake world political order, on the model of a lost or imagined past—often by force of arms. Restructuring aims less radically to restore and support institutions that slow or reverse international political change. The transformative ideological agenda of Nazi Germany and its allies is the best-known case of the former; ISIS’s calls for a return to a supposed golden age also aim at reactionary revisionism. The most prominent example of restructure is was the “Metternich system” of counter-revolutionary interventions at the heart of the Concert of Europe, which sought to maintain monarchical legitimacy at a time of sweeping social and political change. Today, a new, populist reaction is all around us. We see it in the Trump administration, Brexit, the mainstreaming of Europe’s far right, and the persistence of militant Islamism. These events are not just reactionary—they are transnational. 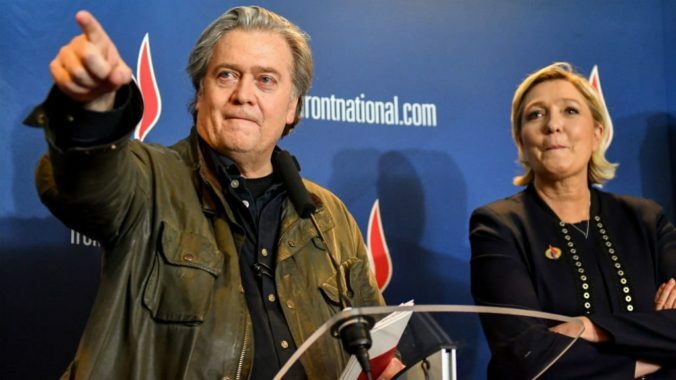 Far-right nativisms and Islamisms alike run on mixed transnational networks of public ideologues, heretofore fringe political parties, radicalized activists, and armed militants. And yet, IR has few if any theoretical categories that treat these ascendant phenomena as fundamentally related. Better attention to reaction will not, of course, explain the whole of recent shifts in world politics. For example, it can’t explain Trump’s recent lurch toward militarism. It likely tells us nothing about populist revivals on the left. We think it’s important all the same to think more carefully in IR about reaction as a distinct strain of thought and practice. Doing so will better enable us to grapple with reactionary international politics in the years ahead. Is this a problem of ducks all the down (not working sufficiently through the social constructed nature of another human object like history) and less an issue of listening to reactionaries? Could we get to the same place of working through the social construction of the past by listening to Nietzsche, Talal Asad, Foucault, or Marx (as opposed to Evola, Schmitt, Buckley, Bodin)? While this piece finds fault with he discipline, is all of the discipline equally blind and under-conceptualized? Can we put the problem-solving theorists on the same ground as the critical theorists, realists on the same grounds as the Copenhagen School, the Foucauldians on the same ground with he liberals?